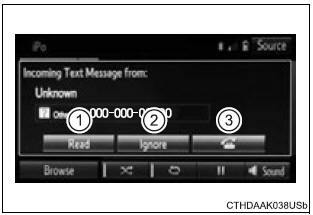 Received messages can be forwarded from the connected bluetooth� phone, enabling checking and replying using the audio system. 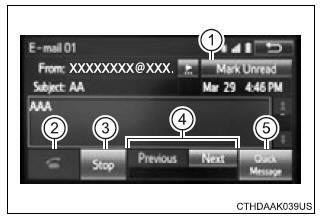 Depending on the type of bluetooth� phone connected, received messages may not be transferred to the message inbox. Select to check the message. Depending on the cellular phone used for receiving messages, or its registration status with the audio system, some information may not be displayed. "incoming e-mail display" is set to "full screen". "e-mail notification popup" is set to on. "incoming sms/mms display" is set to "full screen". "sms/mms notification popup" is set to on. E-mails: select "mark unread" or "mark read" to mark mail unread or read on the message inbox screen. Select to have messages read out. To cancel this function, select "stop". Messages are displayed in the appropriate connected bluetoothr phone's registered mail address folder. Only received messages on the connected bluetoothr phone can be displayed. When "automatic message readout" is set to on, messages will be automatically read out. Turn the "pwr¢evol" knob, or use the volume switch on the steering wheel to adjust the message read out volume. Select �ok� when editing is completed.